Your days watching your pet grow can be described to as an exciting journey. You can keep those memories with you for the rest of your life and will always remember a companion that never leaves your side. The world knows how much you treasure your dog, your best friend. Staying inside your home with your dog pet all the time and watching your favorite shows, and eating and playing around seem simple but it shows comfort with each other’s company. 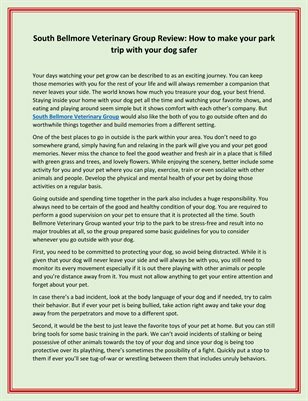 But South Bellmore Veterinary Group would also like the both of you to go outside often and do worthwhile things together and build memories from a different setting.